Anyone else recall this rare IA TV appearance? 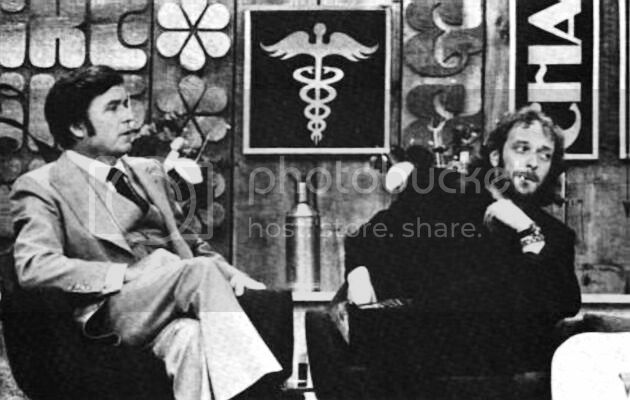 It must have been 1975 or 1976 when Anderson was a guest on the American "The Mike Douglas Show" talk\variety show. I would guess it was around that time because he still had really long hair. He joked that Tull could not perform on the show because the TV studio's electrical capacity would probably be overwhelmed by the band's equipment. But they showed a film clip of Tull performing a song from AQUALUNG. (as Newley was known to do). Anderson said something like "but what does it all mean?" He looked like an angular, Angle bone totem with a five-day growth of beard. With him was space age keyboardist David Palmer. It was time to rehearse. Ian and David were onstage. David at his synthesizer and Ian with a humble guitar upon his knee. An interesting dynamic occurred. While singing, Anderson sported a deep heartfelt smile. Every time the music stopped, his face slipped into an exasperated "well what next" expression. The dissatisfaction was more than rehearsal jitters. It was more than obeisance to an important publicity break. It was more than the flogging — self and otherwise — administered by the artist as perfectionist. It was plain puke-flavored frustration. Something was wrong with the sound. by Jethro Tull legates, the Douglas staff reassuringly claimed to have what was needed. They were mistaken. There was a whole lot of patching going on; but to no avail. Ian preferred not to present a sound that was a poor advertisement for his work. What to do? A prolonged conference went on in the backstage corridor. Chrysalis Records offered a snippet of film of Jethro Tull in performance. Agreed. Great stories. I wonder if there's a YouTube of this anywhere. The snarky "What does it all mean" or the sound problems. I often wondered why Anderson didn't just sing an acoustic song on his own. Now I know- even that was more than the small show could electronically handle! One of the links above indicates that Bob Hope was also a guest that afternoon. I'd forgotten about that.